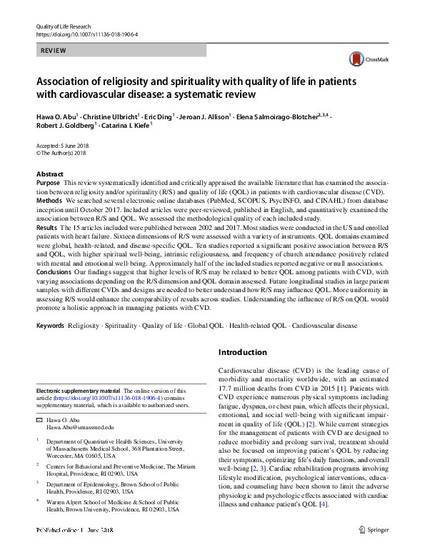 Purpose: This review systematically identified and critically appraised the available literature that has examined the association between religiosity and/or spirituality (R/S) and quality of life (QOL) in patients with cardiovascular disease (CVD). Methods: We searched several electronic online databases (PubMed, SCOPUS, PsycINFO, and CINAHL) from database inception until October 2017. Included articles were peer-reviewed, published in English, and quantitatively examined the association between R/S and QOL. We assessed the methodological quality of each included study. Results: The 15 articles included were published between 2002 and 2017. Most studies were conducted in the US and enrolled patients with heart failure. Sixteen dimensions of R/S were assessed with a variety of instruments. QOL domains examined were global, health-related, and disease-specific QOL. Ten studies reported a significant positive association between R/S and QOL, with higher spiritual well-being, intrinsic religiousness, and frequency of church attendance positively related with mental and emotional well-being. Approximately half of the included studies reported negative or null associations. Conclusions: Our findings suggest that higher levels of R/S may be related to better QOL among patients with CVD, with varying associations depending on the R/S dimension and QOL domain assessed. Future longitudinal studies in large patient samples with different CVDs and designs are needed to better understand how R/S may influence QOL. More uniformity in assessing R/S would enhance the comparability of results across studies. Understanding the influence of R/S on QOL would promote a holistic approach in managing patients with CVD.